Video storytelling draws us in by appealing to our emotions — a faraway woman with big eyes telling us about the children she can barely feed or the excitable entrepreneur full of passion for his idea. And then if done properly, video stories cause people to take action. 1When stories are part of daily work, people work in a different way. They start asking questions and listening to people more deeply. Cara Jones founded Storytellers for Good as a platform for telling and promoting stories of people who are making a positive difference. She believes nonprofits should create a storytelling culture in the work place. “This will have an inspirational impact on all involved,” Jones said by email. If you want to find stories, you’ve got to weave them into your business model, always seeking them out with a method to collect them. Hold a monthly event where you gather your employees to share inspiring stories. Create an organizational story bank to record these stories. 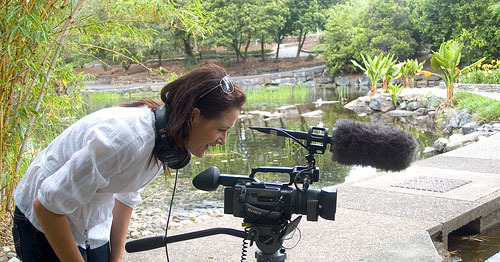 Danielle Bernstein created Clear Films, an independent production company dedicated to social change. She also encourages the nonprofits she works with to think about the stories that surround their missions. She carries a camera with her most of the time. With the rise of easy, handy video cameras, it’s possible for all nonprofits to equip someone on their team with a video camera. When your nonprofit opens itself to stories, it welcomes great work even with limited resources. But you have to find the right stories that people can relate to. 2As you begin to see stories around you, you’ll notice how our stories all contain common threads. Keep yourself aware of the stories that appeal to your personal emotions in some way. These stories are often can be used by nonprofits to make a difference. “The stories that rise to the top for video purposes will be emotionally compelling,” Jones said. “Without emotion, without that feeling, people just don’t get inspired,” Chris Yates said in a phone interview. He created Huddle Productions, which combines social media and video. Sparking inspiration with your videos is important. However, the best videos — the ones that inspire people to act — go further and create a feeling of hope. Tragedy and transformation are key components that work well in nonprofit videos. Both of these can inspire hope when the story has a positive aspect to it. Bernstein talked about the importance of uplifting stories. If people are going to take action after watching a video story, they need to believe that change is possible. The charity:water campaign for clean water in Haiti. charity: water is a wonderful example of a nonprofit using specific stories to support their efforts to bring clean water to people in developing nations. They have a section on their blog devoted to individual stories “from the field” and “from the office.” Also, they highlight stories in their videos. For example, their water campaign for Haiti uses the story of one of their workers to frame the need for help in Haiti. 3The best stories aren’t always the ones that jump out at you. Sometimes the real stories are the ones you only notice after interacting with people several times. Yates doesn’t believe in forcing the story. He doesn’t go into an interview with specific questions. Instead, he allows the story to surface from the conversation. Humans have always communicated using stories. Some stories are hundreds of years old and are still used to teach and inform people today. How is your nonprofit organization incorporating stories into its strategy? Have you used stories in your video campaigns? Tell us in the comments below! • Articles on how nonprofits can create media (Socialbrite)Lindsay Oberst is a freelance writer who writes about art, culture and topics that relate to social and environmental good. Follow her on Twitter at @LindsayOSocial for social good discussions or at @LindsayOWrite to chat about writing. Thanks for this great post! While I agree that video can be truly wonderful for a nonprofit, I think that it’s really important to note that not all video is good. For example, while the easy-to-use Flip cam opens up a whole world of media possibility, video shouldn’t be used just because it’s there – people won’t watch a poorly shot, poorly executed video. Storytelling for a nonprofit is so important, but as I see bad quality videos like this all over the web, I want to comment on another multimedia approach to nonprofit storytelling. I’m working with an organization in Ghana right now that is gearing up for their big fall benefit, where the theme is going to be ‘Learning From our Microfinance Clients.’ There’s so much great content to share, but the budget for video is small, so I decided to use photofilms to tell these stories. Photofilms are basically a multimedia slideshow with narration over the top – they’re a beautiful and cost-effective way to tell a story without the budget or expertise of a video. Thanks for the comment, Lindsey. I absolutely agree that many videos are not good. The ease of creating videos is both wonderful and troublesome. Just because you can film something doesn’t mean you should … unless you’re willing to spend a little time or money to make it good. On the bright side, it also means nonprofits can shoot more videos until they really get what they need. Photofilms are great visual tools too, and often you’ll need stories for these too. Hi Lindsay, we’re big fans of the form — though we’ve always called it digital storytelling, and I haven’t heard the term photofilms until now. Would love to learn more about who’s doing it and how it’s done. I’m currently working on some for an organization in Ghana, I’ll post the links here as comments when we get them up and going! In the link I posted above, the website thedigitalnaturalist.com has some great examples of photofilms and orgs doing them. Check it out! JD – I hope you were able to get ahold of Amy at the Digital Naturalist! She is really doing awesome work. Would love to hear what you think about this particular example. These are perfect for what kind of story we are trying to tell, but may not work for other types of stories. Thanks for the story. I appreciate being part of your article. Here is an example of a video we did for American Red Cross that helped raise $11,000 in one night. Video stirs emotion that can create action. so happy to have found this site. You guys are giving me some awesome ideas. Especially this one it is great.